120 PPM And The Power Of Inkjet From RISO | Industry Analysts, Inc. The Power of Inkjet. Ultimate Speed and Efficiency. Inkjet printers require no heat when printing unlike laser printers. 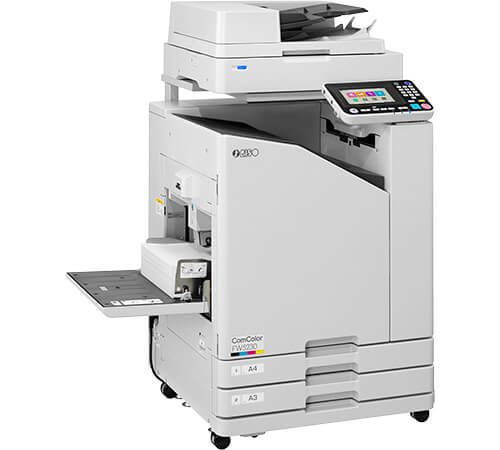 The ComColor FW5230 boasts ultra-fast print speed combined with a fast first print time to streamline printing, helping make busy work environments more efficient. Its ultimately low power consumption prevents paper from curling to reduce paper jams. And because output requires no cooling, pages can be sent immediately after printing to any of your optional finishers, vastly reducing production times. This entry was posted in RISO and tagged ComColor, FW5230, riso by IA Staff. Bookmark the permalink.